Logos distinguishes businesses from each other. And when memorable logo designs are paired with an ingenious brand marketing campaign, organizations can go a long way in terms of sales and/or brand influence. That is why entrepreneurs should carefully plan out how their company logos will look like. However, logo creation is not a task that should only fall into the hands of graphic artists and illustrators. There is nothing wrong with hiring artists to create a professional logo design for your brand. But if you are short on funds and/or have some background on design, some free time, and know what you want for your brand’s logo, you may create your own logo. Logo creation requires a unique set of skills that most ordinary people can harness just by studying how simple image editing tools work. The internet is filled with many free dedicated resources where you can just design your own logo with no strings attached. To help ease your logo design burdens, we have compiled the top websites which provide logo creation services for free. Use them well. Free Logo Design is one of the top results when you Google free logo creation sites. As shown in the screenshot above, website has a sleek design. Right on the main page, you can enter your company or brand name and the category or industry where your business operates in. Four logo suggestions will appear right away on the picture slider below the forms. You may choose right away which design you like or you may click the ‘Start’ button and you will be redirected to the edit page. Free Logo Design’s edit page looks like a simplified version of a photo editing software. What makes the site stand out is the editing page’s simplicity and user-friendliness. The editing functionalities available are only the ones most essential in creating a logo like adding text, images, another logo, icon, shapes, changing background and icon colors, and modifying logo element sizes. Most importantly, freelogodesign.org is free of charge. After customizing a logo, you may then. download a jpeg copy of the graphic. If you want to download a high resolution image, you may avail of the site’s premium version for $59. But if you want the Free Logo Design team to create your logo, you may avail of their professional services for $199. The team has created hundreds of business logos for different industries. While their free site has been used by more than a million business owners worldwide. The site is available in four languages: English, French, Portuguese, and Spanish. Canva is another online resource where you can create logo designs for free. The site is a popular image editing tool since it allows creation and editing of any type of graphic project from social media images, brochures, invitations, to even logo design. What makes Canva stand out among other image editing tools online is its extensive image library and user-friendly interface. You may also upload your own pictures or vector images if you want to edit them through the tool. You may add image filters, text boxes, various font styles, and other design adjustments. It is absolutely free to use the site. However, you may be charged if you incorporate premium content (like fonts, graphics designs, and photos) into your logo project. As long as you choose among the thousands of Canva’s free design elements, then you do not have to worry about the cost. For example, if you are creating a logo for your fresh lemonade juice business, you can go to Canva and create a logo based on the different lemon logo designs found on the site. In case you select a lemon vector with a dollar sign on it, you will be charge for use of that image. A notification prompting you to make a payment before you can download the finished project. Removing the premium component on the image will remove the purchase notification and you can download the image for free. Downloading a finished project is also easier since you will just have to click the save and download buttons. The site also allows cross-platform sharing so you can let your friends and clients see your finished logo right away. Logomakr is another free online tool that allows you to create as many logos as you want. The site offers both free and professional logo design services. The latter may cost up to $299 per designed logo. Creating logos at logomaker.com is very easy since the main URL redirects to the free logo creation tool. The editing interface features a search tab where you can find base symbols and images for your logo. The site has thousands of these images so no two logos can look the same. You may also choose from hundreds of font styles, shapes, and color combinations. The editing pane even allows resizing and various arrangements of any logo design element. Logomakr users can freely resize their logos depending on their needs. Also note that part of the site’s Terms of Service states that all users should properly attribute the logos to Logomakr wherever the user intends to use the logo. The site does not charge for using the logo as long as attribution is made. Logomakr also allows users to get high quality versions of their logos and the ability to use the image without any form of attribution if they pay $19. Logos made through logomakr are saved on the site with its own unique URL. You can take note of this URL (found on the bottom portion of the download screen) and use it to get to editing your logo at any time. Need help designing a logo on logomakr? Check out this short post on the elements of a great logo design. Ucraft is a website builder that is mostly used by online marketers and digital entrepreneurs. Its logo creation tool is just one of the other services that it offers. The site also offers free website hosting (in a partnership with Google), a free landing page tool, an Ecommerce app, and other website design tools. Its logo maker tool is available for free and you will just need to register on the site before you can download your logo design. Its logo editing interface follows a minimalist design where you can choose between inserting icons, text, shapes, change background colors, and gradients. If you are looking to create only simple logo designs (like a shoe logo design), Ucraft will make this task easier. The site’s format allows you to concentrate on creating logos that will match your business’ image instead of delving deeper into the image editing aspects. Ucraft.com has more than 200,000 icons that you can choose from and make different editing variations thereof so you do not have to worry about having a logo that may look similar with other brands’ logos. The Online Logo Maker is a dedicated site just for creating professional-looking logos, signs, and emblems. The site is even available in fifteen more language aside from English. To create a logo, you need to go to https://www.onlinelogomaker.com/logomaker/. You will be redirected to an online editing tool. Just like other logo generators online, Online Logo Maker’s interface follows a simple design where you can add text, symbols, and shapes. What sets Online Logo Maker apart from other dedicated logo generator tools is that it allows you to upload your own image/s if you prefer to base your logo from them. A slight inconvenience with the site is it requires you to register to become a member before you can download the logo that you have created. But after this one time registration, you are free to create multiple logos, edit and download for as many times as you want. Also note that free memberships to Online Logo Maker only allows you to download images with up to 300 pixels. If you wish to get your logos in a higher resolution, you need to get a Premium Membership and avail of other perks for a one time fee of$14. If you have to choose between having a low image quality palm tree logo design under a free account or having a high quality logo designed under a premium membership, it is better to choose the latter because you can still re-use the image for all your business’ branding needs. Squarespace is a website builder and web host popular for primarily providing visually-appealing web templates. It offers other web services like domain hosting and Ecommerce site creation for both commercial and personal use. 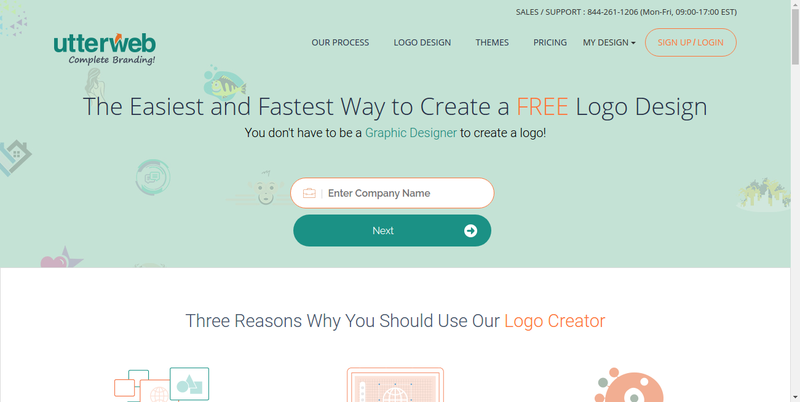 One of its free services is its logo creation tool accessible at logo.squarespace.com. As with other logo making tools online, the site makes use of a simple icon and vectors database. You can search through this collection and customize your logos accordingly based on font, font color, and image size. This online logo builder also shows live previous of your logo placed on different mediums like business cards, T-shirts, and webpages. If you operate a T-shirt printing business, for example, creating sports design logos on Squarespace may be better since you will see a previous of your logo on a T-shirt. Creating and downloading logos on Squarespace is free. However, the free version will retain a Squarespace watermark and should not be used for commercial purposes. These free versions also only allow images with up to 400 x 400 px in resolution. If you intend to use your logo for a client, you may purchase a high resolution and watermark-less version of the logo for $10. Squarespace subscribers are free to create and use these high quality, watermark-less logos. Adobe Spark is part of Adobe’s image editing software suite. What sets Adobe Spark apart from the crowd is its design and image library since it gets some of its resources from Adobe. If you want to design a logo on Adobe Spark, you will need to create an Adobe ID. Once you have your site login credentials, you can begin creating your own logo. Adobe Spark’s user interface follows the user-friendliness of Canva but it is just a little bit more simplified. In Adobe Spark, you can change up the logo’s design, layout, color palette, background, and text. Adobe Spark also retains image editing functionalities common with professional image editing software like being able to layer images on top of each other. Compared with other online logo makers, Adobe Spark will give you more functionalities while ensuring that you get high quality images. If you are already familiar with other Adobe image editing software, you may naturally choose Adobe Spark as an online logo generator. Creating complicated logo designs like these rhino logo designs may be better with Adobe Spark’s editing functionalities. Shopify is an online store platform. The site allows users to create Ecommerce sites with exclusively-built templates that integrates different shopping and payment systems. Users who set up online shops under shopify.com sometimes need to create their own logos to help distinguish their brand online. Hence, Shopify’s online logo creator was made. When you go to the site, you will redirected to an online editing interface. The site allows you to create simple logos based on icons and shapes found on the site’s database. You may also adjust font style, font color, icon position, icon color, and that’s it. For those who already know what they want with a logo and have limited time, Shopify’s free logo creation tool may the one for you. Also note that you need to register a free Shopify account before you can go download your logo. The site follows the usual layout of free online logo creation tools where you first need to enter your Company Name, then choose the industry where the company operates, and write a little information about your company. Different logo suggestions will appear and you can begin editing other elements of the logo design. Since the site also has a web hosting platform, you may create a free web plan that allows you to download the logo for free and also utilize the site’s free web hosting services for three months. Utterweb also offers comprehensive logo branding under their premium plan for $7.99. If you want a thorough representation of your restaurant business, for example, you may want to reconsider creating a chef logo design with the site. The last free online logo creation tool is Free Logo Maker. To access their free logo maker, you will need to visit https://www.thefreelogomakers.com/instant-logo-maker/. The site allows you to choose from different logo templates right on the homepage and you will be redirected to an editing page. You may change font styles, colors, icon colors, and icon sizes. The site also provides explanations on each logo template that will help you decide if the design’s meaning will mesh well with your business or not. Downloading images on Free Logo Maker is also very easy since you only need to register for a free account. After that, you can already download a transparent version of the logo. If you wish to get a higher resolution logo, you may purchase it for $9.99. Are You Ready to Create Your Own Logo? Logo creation can be relatively easy especially if you are willing to learn and accept the fact that you are not going to get everything right on the first try. These free online logo making tools not only saves you time in dealing with creating a logo, it also allows you to gradually learn what works and what doesn’t work in logo creation – skills which you can leverage for you next project. It’s now time for you to stop reading and instead focus on creating that awesome wave logo using any of the free online logo creation tools listed above.